Final edition, shown above, changed the output to EML 300B XLS tubes and added 3 new features. Dual bias meters, an hour meter and dual selection switches for selecting 4,8 or 16 ohm output impedance. It also incorporates a newly designed first gain stage using a 5687 double triode in parallel which lowers the noise level by 3db's. . By using only one quarter of the output voltage gain of this stage further reduces the noise floor by 12 db's. This equates to an astounding overall noise reduction of 15 db's for this voltage amplification first stage. Our innovative output stage led us to redesign the input stage in the final edition to lower the noise floor for use with super efficient horn speakers. With the Voxativ Ampeggio Signature at 101 db you cannot tell that the amps are even on. We are boldly stating and challenge all that these are the lowest noise SET amplifiers ever manufactured! The Ruby 300B monoblocks that we are now building are gold anodized with blue ink filled engraved lettering as shown in the picture above. 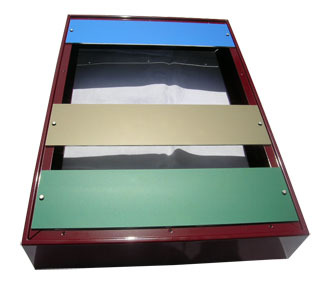 They can be built to order with your preferences in anodized top plate colors and engraved ink filled colors. See below for other color options.
" Hand Crafted for YOUR NAME "
The Ruby series of products is the culmination of my experience and knowledge gathered over the last 20 years as well as some new insights into circuitry that reduces overall noise levels to unprecedented levels resulting in heightened dynamics to accommodate the ongoing increase in resolution in analog and digital recordings. Our goal with the Ruby XR monoblocks was to design the best SET amplifier around the most favoured output tube, namely the 300B Western Electric designed, that would be capable of having enough power to drive most speakers from the better high end speaker manufacturers. We also wanted it compatible with all PREMIUM 300B tube manufacturers available now and in the future to enable plug in and play with our self biased automatic circuits. Our exclusive 300B gain stage circuit design, never before implemented in a tube output stage, has been the most important factor in bringing to fruition the most refined sound ever from a 300B type amplifier. The result is an output stage that has four times the gain of what a single 300B type tube is capable of. This newly developed output circuitry, having no precedent, raises the bar in state of the art development. The Ruby XR 300B monoblocks comes shipped with the Emission Labs EML 300B-XLS. Svetlana 6D22S high current high voltage 6KV rectifier - - 30 second high voltage ramp up until final bias is obtained. - - - Each 6D22S is preceded by a Solid State Bridge Rectifier rated @ 12,000 Volts 1/2 Amp. This stage operates in pure class "A1" single ended plate loaded with independent automatic biasing circuitry for each triode . Both triodes are wired in quasi parallel to take advantage of the 3 db noise reduction using this configuration. This stage also operates in pure class "A1" single ended plate loaded with automatic self-biasing circuitry. This stage operates with high bias current and high voltages needed to drive the four 300B output tubes and do so without driving the 300B grids positive to insure no grid current drive is required. The AC signal is coupled to the 300B grids via 4 independent metalized high voltage, high capacitance Teflon signal capacitors with self healing ability and 1300 Volt DC rating. All 4 output tubes also operate in pure class "A1" single ended self-biased isolated circuitry and transformer coupled output. The 300B gain stage circuitry is exclusive, ground-breaking and unique, being only one of its kind ever to be implemented in a tube output stage. Simply stated it is a serial - parallel single ended configuration that results in increasing the 300B stage gain by a factor of four, unprecedented and unique. Two legs of two series connected 300B's are used in parallel by tying the top plates of each leg to drive the primary of the output transformer. The two bottom tubes of each leg is referenced to ground while the top tubes have floating biasing and signal drive. If either leg of the series connected 300B tubes go out of range the red LED fault light will come on suggesting that these 2 tubes should be replaced. The left two tubes fault light is designated FL and the right series connected tubes is designated FR. Dual triple digit LED bias meters read up to 99.9 Volts using a blue readout for constant monitoring. A LCD hour meter [99,999.9 hours] is now incorporated to keep track of usage, especially important with monitoring the life of output tubes. The 300B filaments, which also act as the cathode for each triode, require isolated pure 5 volt DC power supplies. Each of the four supplies have a separate 7 volt AC secondary winding connected to a full wave bridge rectifier followed by a 10,000uf filter capacitor and terminated using a solid state 5 volt regulator chip. The output transformer reacts to this configuration in such a way that it thinks it has only one tube with four times the power rating of one 300B driving it. In other words this stage uses the same ratio of primary to secondary in the output transformer as would be used in an amplifier with only one 300B output tube. Impedance settings of either 4, 8 or 16 ohms is selectable via two toggle switches located on top rear of each chassis. GROUND LOOP HUM NOT A PROBLEM: No ground lift switch on all wyetech amplifiers. We employ a special network that does not remove ground safety from the chassis. As a consequence Wyetech MONOBLOCK amps don't suffer from ground loop hum pickup! Three Toroid power transformers are used in each monoblock with input AC power operation for 115V-120/230-240V 50-60 Hz selected via an internal toggle switch. Separate DC power supply filtering provide total isolation between the INPUT and OUTPUT stages. This consist of a quadruple-4 (pi) filter for the 500 Volt front end supply and a quintuple-5 (pi) filter for the 1 Kilovolt output stage power supply. Twin bridge rectifiers rated at 12,000 Volts DC provide the needed voltage and current, that in turn feed the 6D22S [6Kv rating] rectifier tubes that enable the voltage to slowly ramp up due to the 30 second delayed warm up time of the 6D22S. The use of pure LC filter networks with 10 very large polypropylene in oil capacitors, 3 large polypropylene capacitors and six large chokes provide an unparalleled ripple reduction and purity of design unequalled in tube SET amplifiers. Rectified, filtered and regulated 12 Volt DC provides the power for the input tube filaments of the 1st and 2nd stage. This also contributes to lowering the noise floor. 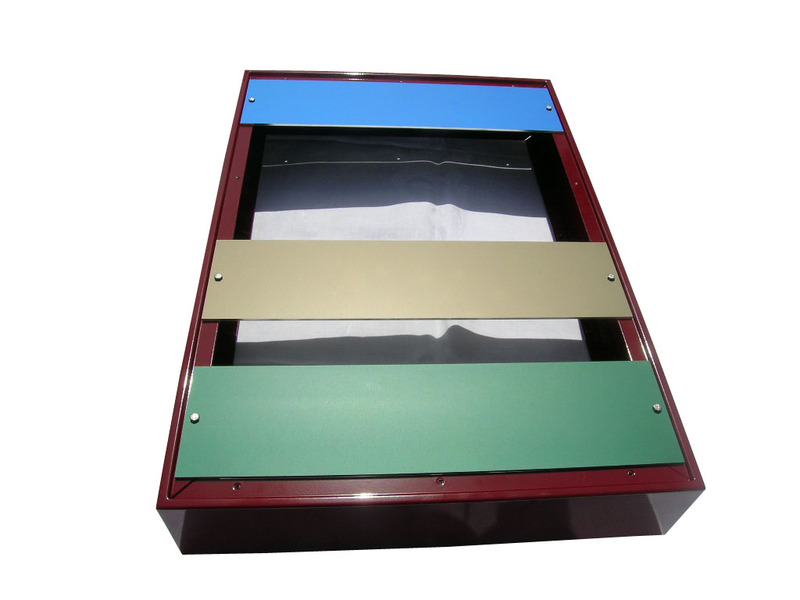 Extremely rugged all welded steel chassis with 4 mm aluminum top and bottom plates provide a solid firm structure by design. 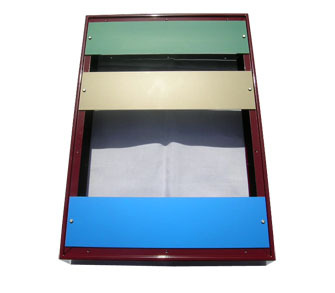 Think of a picture frame doubled up and back to back with the flat top and bottom pieces flush mounted and bolted with 28 stainless steel dress machine screws. This reduces any possibility of vibration induced aberrations affecting the operation of the amplifier tubes. 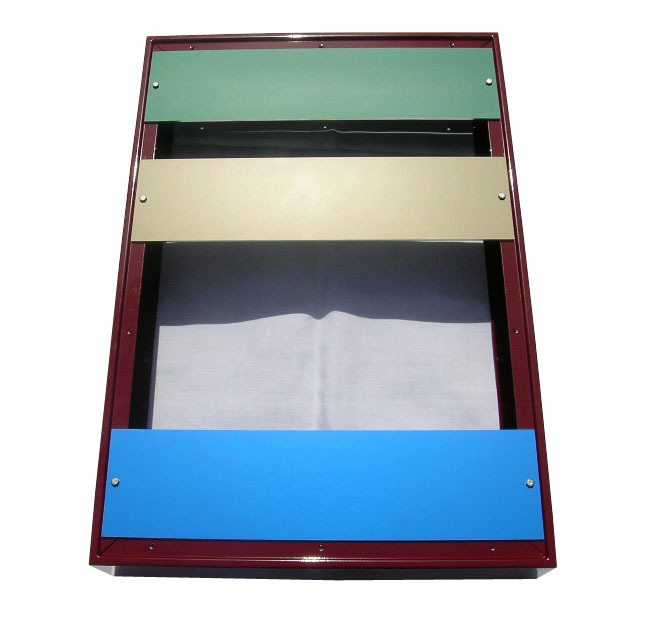 Highly polished 6 inch solid brass handles allow for easy handling and accentuate the chassis styling. Very high quality powder coated chassis frame with baked on finish to further enhance the beauty of the very symmetrical arrangement of parts. Ceramic tube sockets for the high voltage 6D22S rectifier tubes. The components are mounted on three Printed Circuit boards [PCB] which is made from FR4 glass epoxy with double sided copper traces and plated through holes. Both sides have a protective green solder mask. A silk screen is printed in white showing the component layout and parts value. All our PCB's are designed manually with CAD program in house. We use enlarged power and signal line traces to attain the best analog integrity that automatic CAD routing circuit programs cannot attain. The final assembly of parts to the PCB is done by hand soldering of all components which is superior to automated flow-soldering techniques, by allowing more solder on each and every joint. 4% silver solder is used on all solder joints. Wiring to the PCB is attached via screw down crimp terminals to allow for ease of repair or removal. In addition a speaker muting circuit is engaged for 35 seconds on power up and 2 seconds before power down for dead silent operation. We employ a delayed DC power sequencing that maximizes tube life by preventing cathode emission deterioration. The master switch is used to power down the unit. On activation of this switch a 2 second time delay occurs that mutes the speaker output before dropping power thus ensuring silence on powering down. Triple impedance outputs for selecting which one of the three [ 4, 8, or 16 ] impedance's you require by the use of 2 toggle switches. Match the numbers to select. When the one switch is set to the 16 ohm position, it overrides the other switch for 4 & 8 ohm selection. Wyetech Labs warrants to repair or replace any part which proves to be defective through normal use, except external finishes and vacuum tubes, for a period of 5 years from the date of purchase. 18 MONTHS or 2500 Hours on RUBY XR EMS 300B XLS output tubes, whichever comes first. OUTPUT IMPEDANCE SELECT 4,8 or 16 Ohms via the two toggle switches by matching the numbers on each switch. When the one switch is set to 16 ohms, it overrides the other switch setting for 4 or 8 ohms. last updated: 03-Jun-2014 | Â© 1996-2005 Wyetech Labs. All rights reserved.